Kamla is one of the name of goddess lakshmi, who resides on Lotus flower. She is the goddess of wealth, beauty, spritual wealth and prosperity. She is worshipped with lotus seeds mala and Lotus flowers. Maa Lakshmi gives wealth and all comforts of life. Goddess Kamala is one of the Ten Mahavidyas who is known as the wisdom Goddess. She is also the Hindu Goddess of consciousness and creation. Goddess Kamala is represented as a beautiful woman adorned with golden skin and seated or standing on a lotus. She is also seen holding two more lotuses that symbolize both fertility and purity. The Goddess is accompanied by huge elephants who pour jars of nectar on Her. You can place this energized yantra in your puja ghar, cash box, almirah after worship. 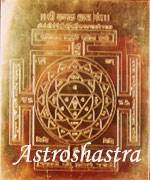 Astroshastra provides you the energized yantra for blessing of Maa Lakshmi to bestow wealth and prosperity on you.